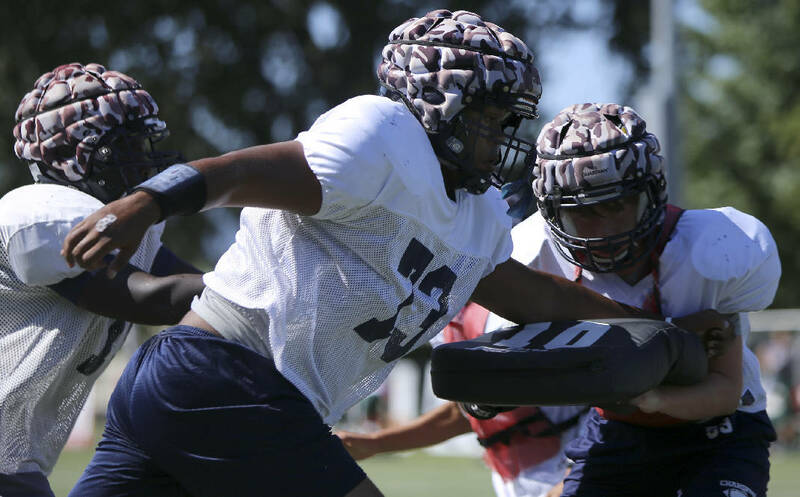 Chattanooga Christian's Keano Roberts (73) blocks during practice at David Stanton Field on the campus of Chattanooga Christian School on Thursday, Aug. 24, in Chattanooga, Tenn. Roberts is an exchange student from The Bahamas. Keano Roberts remembers as a youth watching NFL games on Sundays with his father, Antonio. They found the game to be fascinating, as many fathers and sons do. But most of those who love watching American football live in the United States. The Roberts clan discovered the game while living in the Bahamas. Keano is now a 6-foot-5 1/2, 280-pound sophomore at Chattanooga Christian and is playing on a football team for the first time. He and his Chargers teammates play Howard tonight in what will be Keano's first home game. Urged on by his family — which includes his mother, Nicara, and younger sister, Breanna — Keano came to the United States for education opportunities. In addition to CCS, he applied to schools in Arizona and North Carolina. CCS accepted him through its "homestay" program for international students, which worked out well for Keano because he has a cousin nearby attending Southern Adventist University in Collegedale. It also worked out because CCS began a football program in 2009. "I've always watched football on TV," said Keano, who is in his second year at CCS but in his first on the football team. "Actually, when I came here I started getting into it. I watched it a lot more closely, just being a student of the game." Keano played basketball in his native Nassau, and he also dabbled some with throwing the shot put and discus. He played basketball as a freshman on the Chargers' junior varsity, but that was about 40 pounds ago. Starting with spring practice, he has been a football player. Coach Mark Mariakis has looked at him on both sides of the line and said the offensive side seems to be more his comfort zone. Keano got a little playing time late in last week's loss at McCallie. However, there are concepts about the game he still must grasp before he can progress to the point of pushing for a starting position. "It's tough for that big body to stay low," Mariakis said. "You have to understand leverage and how to get into people's hips. But from where he was in May, when he touched a football helmet for the first time, he's come a long way." All the CCS football players were put through a gut check over the summer when the coaches had some qualified instructors come in and put them through some rigorous Navy SEAL-type testing. That was something Keano said he is proud to have made it through. "Nobody quit," Keano said. "That was the good thing about it." He also spent part of his summer back home in Nassau, where his father is dealing with a kidney ailment. He's in need of a transplant and is currently on dialysis and must be tested to see if he can be a transplant recipient. Keano, who had a 3.37 grade point average in his first year at CCS, said the situation has made him even more focused on academics so he can begin pursuing a professional career. He tries to remain upbeat under the difficult circumstance. "He's a fun kid," Mariakis said. "He smiles all the time. And with his accent, it's hard to get mad at him." Keano said he plans to play basketball again at CCS this winter, but he thinks there may soon come a time when he has to choose between that and football. He said being part of a football team, even for this short amount of time, already has taught him more about himself than anything else he was tried. "This is one of the most encouraging teams I've ever been a part of," Keano said. "They encourage me and have made me better each and every day." And given his frame, Keano may find that football could eventually lead to the educational opportunity he seeks. "With three years in the weight room, the kid could be a monster," Mariakis said. "One of the most exciting things we get to see as coaches in this game is when a young kid develops. I know one thing: He's not going to be limited by his stature."